Founded as the American Pharmaceutical Association on October 6, 1852, APhA today represents more than 62,000 practicing pharmacists, pharmaceutical scientists, student pharmacists, pharmacy technicians, and others interested in advancing the profession. In the 1920s and 1930s, APhA was able to secure coveted land on the National Mall in Washington, D.C., for construction of its national headquarters. Designed by famed architect John Russell Pope, the American Institute of Pharmacy was built at 23rd Street and Constitution Avenue and dedicated in 1934. An annex was constructed later, being dedicated in 1960. Today, the annex has been demolished and has made way for a new addition to the original Pope building, completed in 2009. 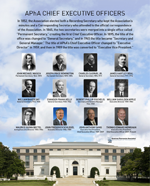 Learn more about the Historic APhA Headquarters Building. Do you have plans to visit the Washington, DC, area? We would love to have you add a tour of the American Pharmacists Association headquarters to your itinerary. A visit to the American Pharmacists Association — the home of pharmacy — offers the perfect mix of historical context with contemporary attractions for everyone with an interest in the traditions and future of pharmacy! Tours are available by appointment only Monday – Friday from 9:00am – 3:00pm (except on holidays.) Two weeks advanced request is appreciated. To make your reservation, e-mail infocenter@aphanet.org or call 800-237-APhA. View the APhA Headquarters Tour Booklet. Boasting unparalleled views of the National Mall and beyond, the rooftop terrace provides a fabulous setting for unique corporate and private events for up to 500 people. Rates and Info. In 1852, the Association elected both a Recording Secretary and a Corresponding Secretary. A few years later, these positions were merged into a single office called "Permanent Secretary," creating the first Chief Executive Officer. Read more about the development of APhA's CEOs. In 2012, we celebrated the Journal’s 100th anniversary. From its humble beginnings to becoming one of pharmacy's leading journals, we commemorate its editors (past and present) with this unique booklet. James Hartley Beal, the first editor of the Journal, described its mission in 1912, “The American Pharmaceutical Association does not exist for the purpose of producing this publication, but the latter has been brought into existence to serve the necessities of the Association.” Read more about the 100-year history of JAPhA. For over 60 years, the APhA Foundation has been successful in recognizing and responding to the changing healthcare needs of the public. As the research and public education counterpart of the American Pharmacists Association (APhA), the APhA Foundation was established in 1953 to improve the quality of patient health outcomes through research, public education, issue forums, awards and recognition of pharmacy practice. View the "History of the APhA Foundation" by George Griffenhagen.